Walking leaves behind no carbon footprint. Walking to work, school, or shopping is also an easy way to integrate exercise into your daily life while conserving fuel and reducing tailpipe emissions. The $25 Drive Less Incentive is available to qualified commuters who make the switch from driving alone to walking, biking, riding the bus, taking BART or commuting by train. The Contra Costa County Interpark Regional Trails consist of more than 150 miles of paved trails that connect various Regional Parks. These linking trails cut through cities and along major streams and channels providing car-free routes for pedestrians and cyclists. Safe use of multiple-use trails requires everyone’s cooperation and common courtesy. Transit and Trails was created by the Bay Area Open Space Council. Since 1990, the Council has been working regionally to protect the land, connect people to land, and convene efforts to steward parks, trails, and agricultural lands. Transit and Trails helps you locate trailheads, plan how to get there by public transportation, and share your outdoor adventures. Try an existing trip – or make a new one! Share pictures and join a community that enjoys exploring parks, trails and open spaces. The East Bay span of the Bay Bridge features a bicycle and pedestrian path from Oakland to Treasure Island, providing fantastic views of the Bay and beyond. 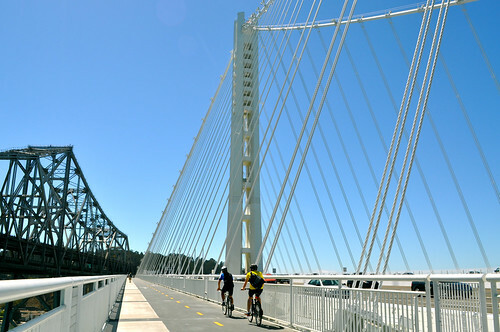 Get details about path access from the Bay Bridge website. In March 2014, Caltrans released the results from its latest California Household Travel Survey (CHTS), which looks at Californians travel. The percentage of California residents walking, biking, or using public transportation more than doubled since 2000; the three modes increased in mode-share, collectively, from 11 percent to 23 percent. Single-occupancy cars remain the most prevalent travel mode. However it now makes up less than half of all trips, having plummeted from 60% to 49% of trips. Interestingly, despite frequently hearing about today’s public transit and bicycling booms, the fastest growing travel mode in the Golden State over the last decade was walking, which more than doubled from 8% of trips to 17% trips. The results from the survey mark a dramatic shift in the state’s travel patterns and show no signs of reversing. Looking at the numbers one can’t help but to wonder– what will the next California Household Travel Survey look like? In 2014, Caltrans, regional transportation agencies and the federal government combined funds to provide $360 million in grants for the Active Transportation Program (ATP). Active Transportation is a term used to describe walking, biking, and transit. The funds for ATP will be targeted at projects like bike lanes, safer intersections for pedestrians, safety improvements leading to and around transit stops, and non-infrastructure programs like Safe Routes To School safety education outreach. Jeanie Ward-Waller is the California advocacy organizer for the Safe Routes to School National Partnership. She said this is the most money by far that has been offered to improve walk/bike routes. But she said that it is also unique because the priorities for awarding the money are not just about transportation. Part of the decision about awarding the money will be based on potential boosts to public health. Some money is earmarked for projects in disadvantaged communities. “It’s watershed in terms of supporting walking and biking, but it’s also a watershed in how it is being targeted,” Ward-Waller said. “I think it’s a new standard about how we are approaching transportation and prioritizing things like public health and sustainability and making sure equity is a lens.” Read the full article in California Report.